On Thursday, April 25 at 7 p.m., we will host a family concert featuring Brent Vernon and Sam. 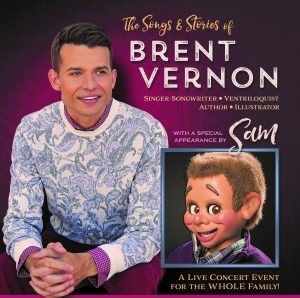 Brent is a singer-songwriter and ventriloquist based in South Florida. He travels full time sharing concerts in churches, schools, and at special events across the country. Join us for a potpourri of energetic, challenging and Hope-filled music. The program includes a visit with Brent’s friend Sam – a hit with kids of all ages! A fun time for the whole family – from kids to seniors.